I recently read an article about the value of traveling with children; I'd been thinking about the same thing. Yes, Nepal is a 'kid friendly' place to go although I seldom see tourists traveling with children. We seem to get those who were recently children, and those with grandchildren, but not so much in-between tourists. When I see tourists eating in a restaurant, I'm prone to strike up a conversation with them to see what I can learn. Not much. It's basically the same as dealing with them at home from what I can tell. Kids will be kids no matter where they go. A couple years ago I met a French family with two pre-school boys and two mountain bikes. They took the boys on their bicycles across Nepal. I met them in the late fall and they told me they'd be back in March to stay a bit in Bhaktapur with me. I didn't think I'd ever see them again, but sure enough, they came back through reporting that they had a great time. You've just got to admire the French! A couple of tips will hopefully encourage you choose Nepal as your family vacation destination. Sometimes I see forum questions about where to buy baby formula or what is available for children in Nepal. Baby formula and all the cool kid themed toys are available in Kathmandu. You'll see Hello Kitty items, anime themes, Angry Birds, etc. all over. There are many tiny, toy stores throughout the Valley. There is also a quality children's store in the New Road area called Peanuts. They have good, fixed prices, toys and better quality children's clothing. There are also many book stores where you can buy new or used books, from classics like Dr. Sues and Nancy Drew to a host of other English books. I'd stick to the international classics for children still learning to read because you will find several typos throughout anything written outside of the US or UK. Two surprises here: You will find new book prices to be a real value, but used books are more expensive than US garage sale or second hand store prices. Safety precaution: This plant is like the stinging nettle plant in the West, Sisnu. If you touch it your finger will burn for a full day. Clothing can be a real bargain here. Be careful about buying Chinese ready-made clothing. It's all inferior quality, much worse than the US import would accept. The best values can be had in buying jeans that are tailor made. They will cost under $10 and can come with a designer sticker. You can also get a lovely, super down jacket for well under $40. Shoes are mostly Chinese crap and not much cheaper than Payless Shoes or some other cheap-shoe outlet in the West. As I mention in my eBook, Nepal: A Tourist's Manual, when the money leaves your hand it belongs to the merchant; refunds can be a real challenge. Next is what to see and do with kids. There is a new water park near Bhaktapur, as well as the old water park and gardens in Balaju. Unless you children are under 10 or so, make sure your girls are dressed modestly. The boys will just strip down and jump in any pond or stream they can find. There is also a Children's Fun Park in the Ratna Park area in the center of Kathmandu. It will remind you of county fairs of days gone by. There are movie cinemas, bowling alleys, video arcades, and even a frozen yogurt bar at the Kathmandu Mall and other places. I blogged about this subject early on. Unchaperoned boys skinny dipping at a Bhaktapur pokhari. Festivals can be wonderful experiences for children. However, they can become intensely crowded to the point of not being able to move in the crowd until it moves en masse. There can be serious issues when taking children into such events. It is much better to find a guest house with a rooftop restaurant to watch the festivities rather than take them into the crowd. There is sometimes a 'tourist section' to relax and enjoy the festival, especially at the Kathmandu Durbar Square when Kumari comes out, which leads me to my next suggestion for children, the Royal Kumari. If you have questions about this tradition you can find a book written by a former Kumari, From Goddess to Mortal. I suggest you do not listen to the stories from the local guides. They like to make it seem crazier than it is, but it is still controversial. The best festivals for children are those when the Kumari comes out, such as Indra Jatra (Sept.), as well as Holi (Feb.-Mar. ), and Gia Jatra (July/Aug.). Come during a full moon for a better chance of an interesting festival. It's really funny, but the one's the Nepali look forward to the most are pretty boring for tourists. Unless you want to experience life in the village I'd pass on all the invitations to join your new friends in their village for Dashain. It's a lot like Christmas, just families getting together to give tikas and eat together. They also give gifts of clothing, fruit and candy. Employers give a full month's pay as a bonus for this festival and everyone-I mean everyone-goes back to the village during this festival. If you come during October you may run into problems with restaurants not being fully staffed. Take extra precautions regarding stomach issues during times such as this. In the fall you can see children flying kites and swinging on huge swings made out of bamboo. Life is hard for children in Nepal, but they seem to be quite happy. Kids in Nepal love to have their pictures taken and practice their English skills. Many of the children in the rural villages only know selective scripts in English, "Hello, how are you?" "I am fine, also," "Where are you from?" and "What is your father's name?" But they love to learn more. One little voice in a village near Kathmandu called out, "I'm so very very hungry," which is what the beggar children say. There are many throw-away kids on the streets of Kathmandu. They sniff glue, dendrite, so they don't feel so hungry, causing irreversible brain damage. This youngster is one of the street kids I got to know. I suggest taking a street kid to lunch with you. Don't give them money or food unless you open the package so they cannot return it. Don't fall for the 'buy my brother some milk' scam. They want a box of 2,000 NRs. powdered milk that will be promptly returned for half price in cash. This boy, Bijay, remembered me even after a couple years, but hadn't grown at all and had lost his ability to talk by the time I last saw him. These are not usually bad kids, just from poor, rural families that unscrupulous social workers take to exploit, promising them work or an education in Kathmandu. Once on the street they become difficult to re-socialize. The end stages are quite sad with them loosing almost all their brain function, but it's something your children will never forget. On a happier note, here is one of my personal, little friends showing off her talent on Youtube. Remember to leave a few days between scheduled activities just in case someone gets a stomach bug. There is a stone you can find in the market that will work as a hand sanitizer called fitkuri. Your children might like to have their own stone. Soap is seldom available in public toilets. If anyone becomes ill you can buy most medicines at any pharmacy without a prescription. As I suggest in my eBook, it's best to go to pharmacies that are attached to a hospital in order to avoid the possibility of counterfeit medicines. Tip: If your child has a habit of nail biting or putting his/her fingers in their mouth you should break them of such habits before bringing them to a country like Nepal. Stay at our guest house and take our easy 3 hour cultural trek one day and then the 5 hour hike to Nagarkot, stay over-night at our friend's guest house and then hike up to the tower to see the sunrise over Mt. Everest. See the Royal Kumari in Kathmandu's Durbar Square. I try to resist including things you can find in the Lonely Planet or other guide books, but I just cannot resist the Royal Kumari. This Kumari comes out daily around 4 pm. Check for other times at the ticket office for Durbar Square. If you and your children enjoy seeing the Royal Kumari and then subsequently go to Patan's Darbur Square ask for directions to that Kumari. Because she is not the Royal Kumari you can bring the children up to have an audience with her and get a blessing from her. Do a village stay, either in Changunarayan or in another village. I have a friend who works as a trekking guide and does a lovely home-stay in his remote village; it is quite remote, but I do not remember the road being particularly hazardous. He is Buddhist and can take you to some Buddhist ceremonies. 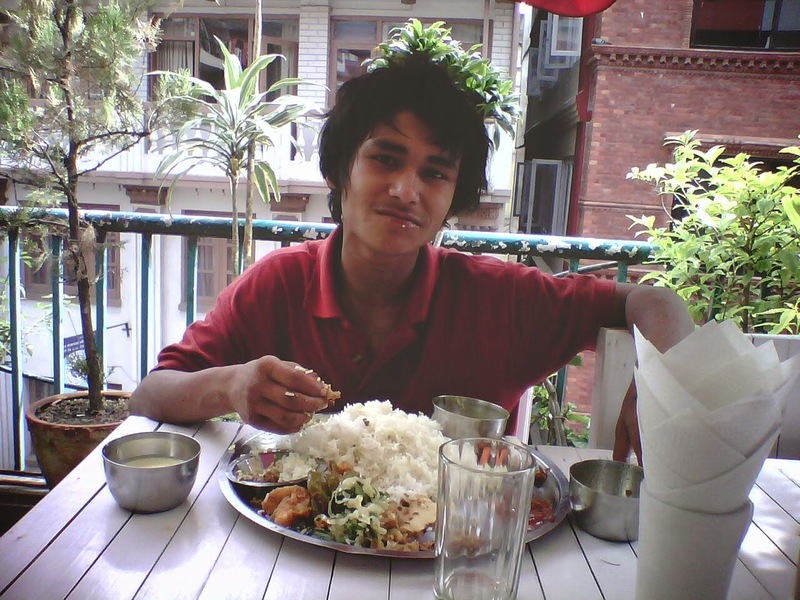 You can call Supa Tamang at 980 8601028, email: supatamang@yahoo.com or look for him on Facebook. If it isn't too hot when you come to Nepal your children will love to go on an elephant safari in Chitwan and spend a few days there. Bring binoculars. Rather than take the trip to Chitwan or Pokhara in one full day, from 7 am to 3:30-4:00 pm, you may consider staying at a point in-between such as Bandipur for a night or two. A couple of my visitors wrote about doing this. Consider doing short treks closer to the Kathmandu Valley rather than spending so long on the bus. The roads are infamously horrible in Nepal and there is plenty to see without going into the high mountains. If your children tend to be accident-prone it might be best to avoid altitudes that can bring on high altitude sickness. One of the main symptoms is clumsiness. If you haven't seen One World Theater's 'The Laramie Project' yet, don't miss it. We saw it last week and thought it was their best work yet, Fantastic! trekking in Nepal can be enjoyed all the year around, but the best season to trek in most of the trails of Everest, Annapurna and Langtang, Manaslu, area is spring (March to May) and autumn (mid September to December) as the weather is best and you can get clear views of mountain in these time of year. You can trek along the rain shadow area like Upper Mustang and Lower Mustang during monsoon season too. Monsoon does not affect these areas as these are rain shadow area. Great site! Found it very insightful. I know this is off topic but do know of anything that I could bring from the US to sell in Nepal that would offset the cost of a flight? like a premium phone, laptop our designer clothes?